Life is made up of so many moments in time. Moments that define us. Moments that move us. And often moments that change us. Driving to Springfield, Vermont—fours hours one way—had me thinking of the many moments that were coming. I was leaping into unfamiliar territory, and like usual, I was jumping in feet first. From the moment I came across the Art Monastery, I felt in my heart that it was the next step in my journey of growth and personal development. 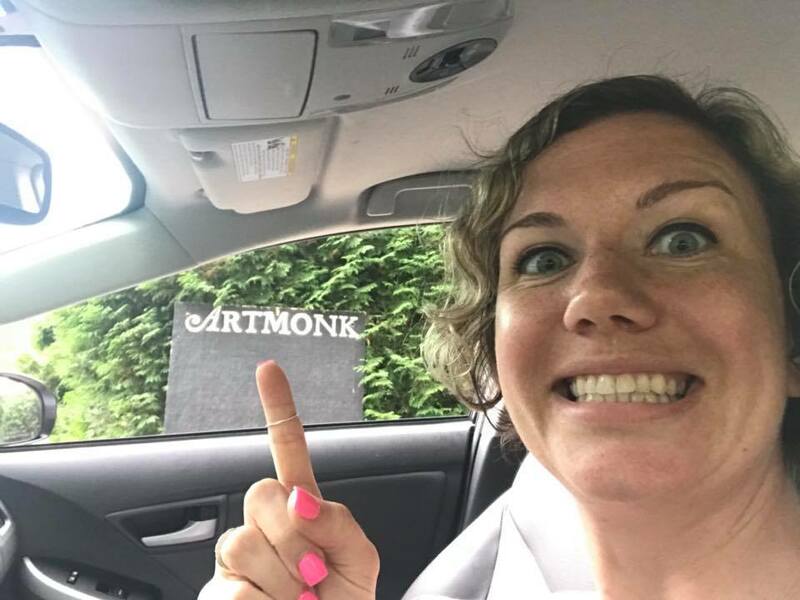 Weeks went by until the day I parked my car in front of the rustic, welcoming and radiant home of the Art Monastery. That was when I met Betsy. Barefoot, beautiful and full of an energy that flowed from her. My entire self knew I was where I was supposed to be. Later that night, sitting at dinner a couple of hours before we took our vow of silence for the week, I felt like the new kid in town. Everyone knew meditation. Everyone knew yoga. Everyone knew how to lose themselves in their art. And here I was ready to learn how to do it all in seven, silent, filled days. There is something special in the silence of life. Something special from interacting with others when not one word is spoken. Gestures, expressions, actions. Every movement suddenly means so much and says so much. In those seven days, I found soul sisters and soul brothers that will always be a part of me for as long as I breathe. Every piece of food we ate was something new for me, and every piece of food was not only completely delicious but felt like it fed more than my body. Knowing that so much of it came from the very land we were walking on felt as if I was living off the land. It was a grounding and humbling experience felt through exquisite food. Through movement and expression and utter abandon of any rules or preconceptions, I was lost in wild dances. Through silence, I learned to focus and lose myself in words and emotions as I created story scenes with nothing but a dream to start. Through stillness, I heard my heart and soul speak to me and show me my dreams, remind me who I was, and reassure me that I was coming home to myself. The Art Monastery was more than a change, more than a simple groove in my life. It was my light. It was my sun. It lit the way to a path that I needed, that I craved. Not even five months have passed and I have dug deeper into finding myself than I have in all my 34 years before this. And all of it, every journal entry, every new page I write in my book, every time I am still and meditate, every time I pause and watch the sun rise or look up to see the breeze flow through the trees, every time I am 100 percent Miscelleana, every time I make a new vow for myself and my life, every time I am lost in color as I paint, every time I take a breath with grace, every time I forgive, every day when I ask my children what they are grateful for, every time I bow in gratitude, every time I glory in the world around me even for just a moment….I know that all of it started from my sun, my Artmonk home, my beautiful Abbess Betsy, and my new Artmonk brothers and sisters. I am coming home to myself every single day, and I thank the universe with every part of me for showing me the way to The Art Monastery.